Sunday, Oct. 13 Our adventure begins in Barcelona. The group will meet in the late morning at the Palau de la Musica café and then board a private coach to head to our Costa Brava accommodation, a fabulous seaside hotel. Upon arrival and after check in, we will have a meet and greet orientation lunch followed by an introduction class to Simple Sketching© while traveling. You will then have some free time in Calella de Palafruguell before our evening cocktail party (tapas included). After a great breakfast at the hotel, we will meet our Dalí expert host for the day and depart for Portlligat, where Dali's home is located. After a private tour of the house (you may take pics, no sketching on site) we will drive to Cadaques where you may enjoy some free time for sketching and lunch on your own. We will then return to our hotel to work on our journals together in the comfort of the enclosed patio overlooking the mediterranean. (Dinner on your own; options include the hotel bar, restaurant, or walking into town). We'll all meet for breakfast at the hotel, and then depart for Besalu, a fabulous medieval village. Upon arrival Judith will host an art lesson and demo. We will then have a fantastic lunch in stunning setting (included), followed by some free time for sketching on your own in Besalu. In the late afternoon we will depart for the hotel. Dinner is on your own. We will enjoy a final breakfast at our hotel, then pack up and check out. 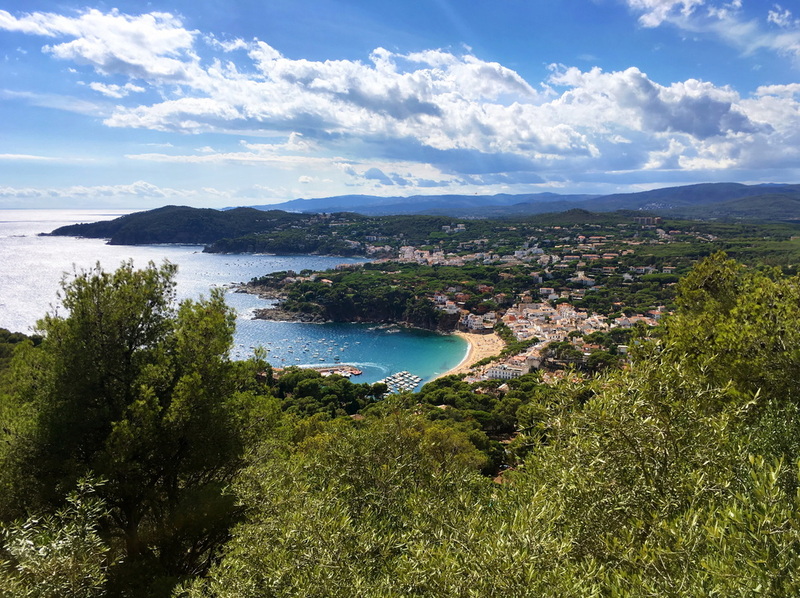 This day will begin with a transfer to Alella where we will enjoy an authentic La hora del Vermut, with a special lesson on sketching interiors followed by a light lunch of tapas. After lunch we will head to Barcelona to get you checked into your apartments. You will have a free evening and dinner on your own. Today is a full day of Barcelona Sketching. We will begin with an early morning meeting in front of the Cathedral of Barcelona for continental breakfast and a sketching demo. We will sketch Sant Felip Neri Plaza and the Santa Caterina Market then hop on the metro and head to the Hospital de Sant Pau. 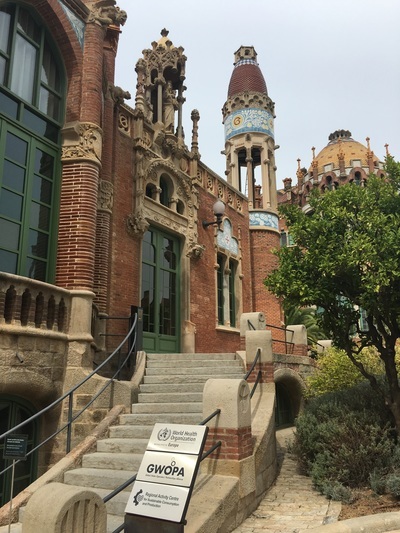 Here you will have the a great opportunity to learn about and sketch Catalan Modernism. We’ll have a festive group lunch (included): the afternoon and evening will be on your own. Students are expected to check out of the apartment by 11:00am. If you wish to extend your stay you can make arrangements with Danny, there will be an extra charge. for students wishing to add to their time in Barcelona, Danny will set up tours for time before or after our group trip. Our adventure begins in Seville! We will meet at our hotel where we will drop our luggage, then head out for a guided walking city tour, covering the most important monuments of the city. You will visit Plaza Nueva, the City Hall, the Alcazares palace, the charming neighborhood of Santa Cruz, the old Tobacco factory, Plaza de España, the Maria Luisa Parque, the San Telmo palace, the Gold Tower, the Bull Ring, and the Guadalquivir river. For this initial outing, students will be encouraged to use phone cameras to record their impressions. Following our tour, we will enjoy a welcome drink on the rooftop of our hotel that will include an orientation session and a review of the Simple Sketch© concept for travel journaling. We will then head to a nearby tapas bar for a light dinner (included) and finally visit a fantastic, intimate Flamenco venue for a terrific show. After a great breakfast at the hotel, we will head out as a group to a central plaza for a lesson on how to capture the intricate Sevillano architecture. Judith will give you some valuable tricks for sketching this amazing city and its wonderful buildings. You will then have free time to apply what you learned and sketch. Lunch is at leisure (on your own). In the afternoon, we will come back together as a group and be joined by an official monument guide to take you inside the Cathedral, learning all about this amazing monument. We will then take a stroll over the Puente de Isabel II, getting to the fun & historic neighborhood of Triana. Here you can stop and sketch as we loose the sun, visit the Triana market or search out a piece of ceramic art that calls your name. We will reconvene for a drink and some tapas (light dinner, included). Following breakfast at the hotel, we will be picked up by our private minibus and drive to Jerez de la Frontera (1 hour), heading straight for the Royal Andalusian School of Equestrian Art. Judith will lead a lesson on capturing the movement & energy of these magnificent horses and their trainers. Then we will enter for a fantastic horse dance ballet, accompanied by quintessential Spanish music and 18th-century style costumes. Each show consists of 6-8 different choreographies. During the 90 minute show, you will be able to sketch or photograph the scene. We will then drive 30 min to the coastal city of Cadiz for a seaside lunch (included) . After lunch you will have some free time to explore Cadiz before we return to Seville. Dinner is on your own. After breakfast, we will check out of our hotel and start our drive to east, towards the famous Andalusian white villages. Upon arrival at one of our favorites, Grazalema, we will host another sketching lesson followed by some free time to sketch in the beautiful white washed town. 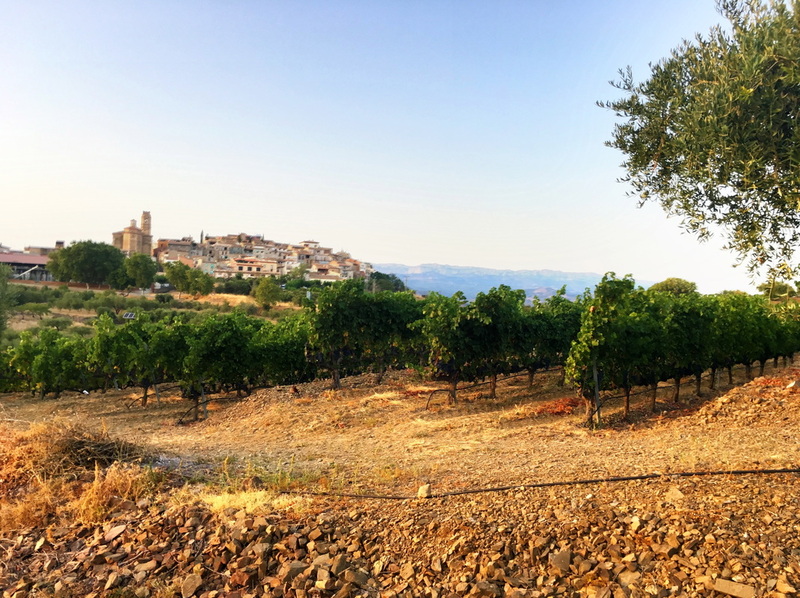 Once we all start to get hungry, we will work our way towards Ronda, stopping at a lovely family run estate hotel for an incredible lunch in a picturesque environment (included). There will be some time to sketch following lunch, and then we will drive 20 min to check in to a Parador for the night in Ronda. Wake up in beautiful Ronda and have a great breakfast at the Parador. After a sketching demo, you will then have all morning free to wander the beautiful medieval city and sketch its three ancient bridges. At noon, already checked out of the Parador, we will be picked up by our minibus and drive to a nearby family-run winery. Here we will have a tasting and fantastic lunch (included), prepared by the winemakers. There will be some time to sketch on your own before we begin our 2hr drive to Granada. On arrival we will get checked into our centrally located hotel and dinner with be on your own. Granada, the last kingdom to be reconquered by the Catholic Monarchs, has an incredible artistic and historic heritage as well as a truly Moorish flavor. After breakfast at the hotel, we will head to La Alhambra, the most important existing building of Muslim civil architecture. Before entering, we will have our final lesson, summing up the techniques that we have learned so far and gaining some tricks for capturing the incredible geometric patterns. All the refinement, wealth and delicacy of Islamic art and architecture reached its climax in the South of Spain, in this unique building which is a fortress, a residence and a royal city all in one and extends itself in the gardens of El Generalife. We will have a guided tour of the grounds, so that you have some context for your artistic inspiration. Following our tour, you will have some free time to continue sketching, or grab a bite to eat (on your own). That evening we will meet up again for a goodbye cocktail party with drink, and tapas. Here we will wrap up and review our Sketching Spain, Andalusian adventure. It will be a terrific celebration of a week spent sketching, laughing, exploring and building a supportive community. ​After breakfast, our driver will pick us up at 11am and bring the group back to Seville where our adventure comes to a close and we will all say goodbye. You may choose to be dropped off at the airport or train station. If you choose to extend you time in Seville (or anywhere in Spain) Danny can assist you with plans. I'm thinking about this trip, but I have never sketched~? No problem! Please be assured that Judith will guide you thru some simple steps so you can enjoy your time recording the magnificent views on the trip, regardless of your previous art journal or drawing experience. With a small group (class is limited to 10 students on each trip) there will be plenty of individual instruction. We will include instructions on fun ways to use our phone cameras and explore a mixed media approach for those wishing to collage their pages with minimum sketching. However, we do hope that even if you don't consider yourself accomplished (at least satisfied) with sketching you will be open to learning. It is always much more fun if the group is working together. If you are interested in the specific lessons that will be covered on the trip, please email Judith. Any suggestions for flight arrangements to/from the US? ​Since both trips have a minimum number of students, we strongly encourage you to wait to purchase air fare until hearing that your trip will run. Both Danny and Judith can advise you regarding flights and can suggest either on-line booking or using a trusted travel agent in Denver. We encourage you to arrive a day or two before the trip so you have time to acclimate. How do I get to and from the Barcelona or Seville airport? Transport is not included in the Sketching Spain fee, but may be arranged with Danny Adler on an individual basis. It is really easy to walk to the taxi stand just outside of both the airports. I am attending with a friend/spouse, can we share a room or apartment? All of our hotels have rooms with queen or king beds. It would be your choice about sharing a room. During the free time in either city I'd like to see additional points of interest that I have read about; how will I get around on my own? Danny can advise you for exploration on your own. This is the advantage of having a professional guide with us each day. How can I make arrangements to stay in the Barcelona apartment after the tour if I wish to stay a few days longer? You will have the option of extending your visit to Barcelona by booking extra lodging thru Danny directly, depending on availability. You can also book your lodging thru your own travel agent or thru searches online. What art materials will I be asked to bring? Students will be sent a list of art supplies to bring on the trip along with a short video tutorial showing various sketchbooks and materials. We are going to travel light; each student will bring their own materials. Students are encouraged to carry their art materials in a very light day pack. No need to bring a portable stool; we will loan each student a small chair to use throughout the trip. ​Will I have time to do some photography? Absolutely! Our sketching time will allow students time to explore the area with their cameras if they prefer. Judith will be happy to share information about portable printers that are great for travel. What will the weather be like (typical October)? Typical weather in Spain in October includes dry, sunny and mild temperatures with averages ranging from 55° - 70° degrees; perfect! However, rain can also fill our days. We have planned the itinerary with a "plan B" in mind in case it is not comfortable to be sketching outdoors. We suggest students bring a small umbrella and light rain coat just in case, but also include a sun hat. How will we be traveling from one destination to the next? We will be in a comfortable private coach for most of the trip. While in Barcelona, we may use the subway (fare included). The price of all transport is included. When on your own taxis are inexpensive in both Seville and Barcelona, and the metro system in Barcelona is easy to use. Your deposit and fees are non-refundable. We strongly suggest each student inquire about insurance before submitting their deposit for the trip to find out how time sensitive the transaction will be. 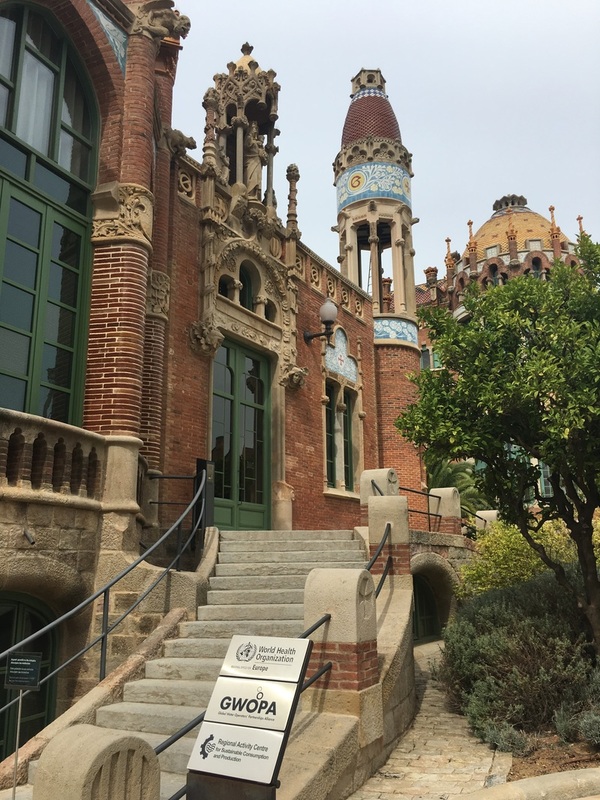 Most students purchase travel insurance as soon as they purchase their airline tickets and/or when they make the final payment on the Sketching Spain trip. Yes, Yes, Yes! You are strongly encouraged to purchase travel insurance since the tour fees are non-refundable. Airlines offer insurance and there are many independent dealers who may be contacted online. Please be aware that purchasing insurance is time sensitive; some companies require insurance to be purchased within a few days of reservations. No problem! We are prepared for Gluten Free and vegetarian options, and will survey participants for other dietary considerations before the trip and will accommodate everyone at all included meals. 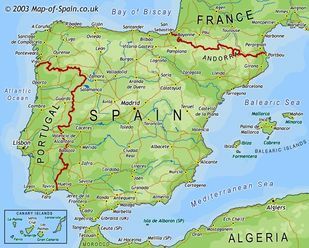 Please check the itineraries for specific meals and note, typical lunches in Spain are later in the day than in the US, multi course meals which usually means that dinner is often not necessary! All drinks with your meals are also included, whether it is wine or non alcoholic. We will cover your entrance fees to all locations on our itinerary. Students will pay for meals not listed in the itinerary and any additional transportation that is not part of the tour. Additionally, Danny will suggest an amount to tip our coach driver and local tour guides. Any “add on” tours scheduled before or after our trip will be an extra charge at the time of booking. How rigorous will the walking/touring be? Generally, students travel at their own pace when we are not working as a group for sketching or on a formal tour. Many of the sketching locations are easily accessed but on uneven ground. If walking is an issue, we suggest bringing a fold-up walking stick for stability and comfy shoes. We will provide you with a portable chair in some locations so you are as comfortable as possible when sketching. Travel light! Spain is fairly casual. A small, carry on suitcase is recommended as you be moving your luggage from your room to the coach when we change hotels. Comfy walking shoes and a light day pack to hold your art materials are a must. We will be driving on some windy roads along the coast so please bring motion support (Dramamine, etc) if you know you have difficulty in this area. Tourists anywhere are an easy mark for pickpockets, so it is advised that you carry your wallet in a secure fashion. Suggestions for keeping connected to folks at home? Please check with your individual phone carriers to determine the best plan for you. You will have access to WiFi in all of our hotels and apartments. Other tech suggestions: we will stay connected on the trip thru WhatsApp which is a free phone app we would like you to download before arrival. We will share our cell numbers with the group so we can confirm meeting times, etc. during the adventure. All fees for the trip are quoted in Euros only. The conversion of dollars to Euros varies; you may wish to keep an eye on the conversion rates thru: www.xe.com for an accurate daily rate. The conversion will be made as soon as you submit your payment and it will be based on the rate that applies to that day. Any other questions? Please email Danny or Judith - you can expect an answer quickly!